For the American technical death metal band, see Pyrrhon (band). Pyrrho of Elis (/ˈpɪroʊ/; Ancient Greek: Πύρρων ὁ Ἠλεῖος, translit. Pyrrhо̄n ho Ēleios; c. 360 – c. 270 BC) was a Greek philosopher of Classical antiquity and is credited as being the first Greek skeptic philosopher and founder of Pyrrhonism. Pyrrho of Elis is estimated to have lived from around 365-360 BC until 275-270 BC. Pyrrho was from Elis, on the Ionian Sea. Diogenes Laërtius, quoting from Apollodorus of Athens, says that Pyrrho was at first a painter, and that pictures by him were exhibited in the gymnasium at Elis. Later he was diverted to philosophy by the works of Democritus, and according to Diogenes Laërtius became acquainted with the Megarian dialectic through Bryson, pupil of Stilpo. Pyrrho, along with Anaxarchus, travelled with Alexander the Great on his exploration of the East, 'so that he even went as far as the Gymnosophists in India and the Magi' in Persia. This exposure to Eastern philosophy seems to have inspired him to create a new philosophy and to adopt a life of solitude. Returning to Elis, he lived in poor circumstances, but was highly honored by the Elians, who made him a high priest, and also by the Athenians, who conferred upon him the rights of citizenship. Pyrrho did not produce any written work detailing his philosophical principles. Most of the information on Pyrrho’s principles comes from his most notable follower, Timon, whose summary of Pyrrho's teachings are preserved in the Aristocles passage. However, there are conflicting interpretations of the ideas presented in this passage, each of which leads to a different conclusion as to what Pyrrho meant. 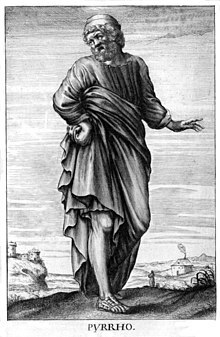 Most biographical information on Pyrrho, as well as some information concerning his demeanor and behavior, come from the works of mid-third century BC biographer Antigonus of Carystus. Biographical anecdotes from Diogenes Laertius are also frequently cited; his work on Pyrrho's life drew primarily from Antigonus' accounts. Pyrrho wrote nothing. His doctrines were recorded in the writings of his pupil Timon of Phlius. Unfortunately these works are mostly lost. Little is known for certain about the details of Pyrrho’s philosophy and how it may have differed from later Pyrrhonism. Most of what we know today as Pyrrhonism comes through the book Outlines of Pyrrhonism written by Sextus Empiricus over 400 years after Pyrrho's death. Most sources agree that the primary goal of Pyrrho’s philosophy was the achievement of a state of ataraxia, or freedom from mental perturbation, and that he observed that ataraxia could be brought about by eschewing beliefs (dogma) about thoughts and perceptions. However, Pyrrho’s own philosophy may have differed significantly in details from later Pyrrhonism. Most interpretations of the information on Pyrrho’s philosophy suggest that he claimed that reality is inherently indeterminate, which, in the view of Pyrrhonism described by Sextus Empiricus, would be considered a negative dogmatic belief. A summary of Pyrrho's philosophy was preserved by Eusebius, quoting Aristocles, quoting Timon, in what is known as the "Aristocles passage." "Whoever wants to live well (eudaimonia) must consider these three questions: First, how are pragmata (ethical matters, affairs, topics) by nature? Secondly, what attitude should we adopt towards them? Thirdly, what will be the outcome for those who have this attitude?" Pyrrho's answer is that "As for pragmata they are all adiaphora (undifferentiated by a logical differentia), astathmēta (unstable, unbalanced, not measurable), and anepikrita (unjudged, unfixed, undecidable). Therefore, neither our sense-perceptions nor our doxai (views, theories, beliefs) tell us the truth or lie; so we certainly should not rely on them. Rather, we should be adoxastoi (without views), aklineis (uninclined toward this side or that), and akradantoi (unwavering in our refusal to choose), saying about every single one that it no more is than it is not or it both is and is not or it neither is nor is not. It is uncertain whether Pyrrhonism was a small but continuous movement in antiquity or whether it died out and was revived. Regardless, several centuries after Pyrrho lived, Aenesidemus lead a revival of the philosophy. Pyrrhonism was one of the two major schools of philosophical skepticism that emerged during the Hellenistic period, the other being Academic skepticism. Pyrrhonism flourished among members of the Empiric school of medicine, where it was seen as the philosophic foundation to their approach to medicine, which was opposed to the approach of the Dogmatic school of medicine. Pyrrhonism fell into obscurity in the post-Hellenic period. Pyrrhonists view their philosophy as a way of life, and view Pyrrho as a model for this way of life. Their main goal is to attain ataraxia through achieving a state of epoche (i.e., suspension of judgment) about beliefs. One method Pyrrhonists use to suspend judgment is to gather arguments on both sides of the disputed issue, continuing to gather arguments such that the arguments have the property of isostheneia (equal strength). This leads the Pyrrhonist to the conclusion that there is an unresolvable disagreement on the topic, and so the appropriate reaction is to suspend judgement. Eventually the Pyrrhonist develops epoché as a habitual response to all matters of dispute, which results in ataraxia. The sources and the extent of the Indian influences on Pyrrho's philosophy, however, are disputed. Some elements of philosophical skepticism were already present in Greek philosophy, particularly in the Democritean tradition in which Pyrrho had studied prior to visiting India. Richard Bett heavily discounts any substantive Indian influences on Pyrrho, arguing that on the basis of testimony of Onesicritus regarding how difficult it was to converse with the gymnosophists, as it required three translators, none of whom understood any philosophy, that it is highly improbable that Pyrrho could have been substantively influenced by any of the Indian philosophers. According to Christopher I. Beckwith's analysis of the Aristocles Passage, adiaphora, astathmēta, and anepikrita are strikingly similar to the Buddhist Three marks of existence, indicating that Pyrrho's teaching is based on Buddhism. Beckwith disputes Bett's argument about the translators, as the other reports of using translators in India, involving Alexander the Great and Nearchus, say they needed only one interpreter, and Onesicritus was criticized by other writers in antiquity for exaggerating. Beckwith also contends that the 18 months Pyrrho spent in India was long enough to learn a foreign language, and that the key innovative tenets of Pyrrho's skepticism were only found in Indian philosophy at the time and not in Greece. It has been hypothesized that the gymnosophists were Jains, or Ajnanins, and that these are likely influences on Pyrrho. Pyrrhonism regained prominence in the late fifteenth century. The publication of the works of Sextus Empiricus played a major role in Renaissance and Reformation thought. Philosophers of the time used his works to source their arguments on how to deal with the religious issues of their day. Major philosophers such as Michel de Montaigne, Marin Mersenne, and Pierre Gassendi later drew on the model of Pyrrhonism outlined in Sextus Empiricus’ works for their own arguments. This resurgence of Pyrrhonism has been called the beginning of modern philosophy. Pyrrhonism also affected the development of historiography. Historical Pyrrhonism emerged during the early modern period and played a significant role in shaping modern historiography. Historical Pyrrhonism questioned the possibility of any absolute knowledge from the past and transformed later historian's selection of and standard for reliable sources. ^ Hugh Chisholm, ed. (1911). Encyclopædia Britannica. 22 (11th ed.). Cambridge University Press. p. 696. ^ Home., Bett, Richard Arnot (2000). Pyrrho, his antecedents, and his legacy. Oxford: Oxford University Press. ISBN 9780198250654. OCLC 43615424. One or more of the preceding sentences incorporates text from a publication now in the public domain: Chisholm, Hugh, ed. (1911). "Pyrrho of Elis" . Encyclopædia Britannica. 22 (11th ed.). Cambridge University Press. p. 696. ^ a b c d e f Bett, Richard; Zalta, Edward (Winter 2014). "Pyrrho". The Stanford Encyclopedia of Philosophy. Retrieved February 19, 2018. ^ a b c Popkin, Richard Henry (2003). The History of Scepticism : from Savonarola to Bayle (Revised ed.). Oxford: Oxford University Press. ISBN 9780198026716. OCLC 65192690. ^ "The Lives and Opinions of Eminent Philosophers". Peithô's Web. Retrieved March 23, 2016. ^ Richard Bett, Pyrrho, His Antecedents and His Legacy, 2000, p177-8. ^ Beckwith, Christopher I. (2015). Greek Buddha: Pyrrho's Encounter with Early Buddhism in Central Asia (PDF). Princeton University Press. p. 28. ISBN 9781400866328. ^ Beckwith, Christopher I. (2015). Greek Buddha: Pyrrho's Encounter with Early Buddhism in Central Asia. Princeton University Press. p. 221. ISBN 9781400866328. ^ a b Barua 1921, p. 299. ^ Jayatilleke 1963, pp. 129-130. ^ 1985-, Matytsin, Anton M. (2016-11-06). The specter of skepticism in the age of Enlightenment. Baltimore. ISBN 9781421420530. OCLC 960048885. Algra, K., Barnes, J., Mansfeld, J. and Schofield, M. (eds. ), The Cambridge History of Hellenistic Philosophy, Cambridge: Cambridge University Press, 1999. Annas, Julia and Barnes, Jonathan, The Modes of Scepticism: Ancient Texts and Modern Interpretations, Cambridge: Cambridge University Press, 1985. Barua, Benimadhab (1921). A History of Pre-Buddhistic Indian Philosophy (1st ed.). London: University of Calcutta. p. 468. Beckwith, Christopher I., Greek Buddha. Pyrrho's Encounter with Early Buddhism in Central Asia, Princeton University Press, Princeton and Oxford, 2015. Bett, Richard, "Aristocles on Timon on Pyrrho: The Text, Its Logic and its Credibility" Oxford Studies in Ancient Philosophy 12, (1994): 137-181. Bett, Richard, "What did Pyrrho Think about the Nature of the Divine and the Good?" Phronesis 39, (1994): 303-337. Bett, Richard, Pyrrho, His Antecedents, and His Legacy, Oxford: Oxford University Press, 2000. Brunschwig, Jacques, "Introduction: the Beginnings of Hellenistic Epistemology" in Algra, Barnes, Mansfeld and Schofield (eds. ), The Cambridge History of Hellenistic Philosophy, Cambridge: Cambridge University Press, 1999, 229-259. Burnyeat, Myles (ed. ), The Skeptical Tradition, Berkeley: University of California Press, 1983. Burnyeat, Myles and Frede, Michael (eds. ), The Original Sceptics: A Controversy, Indianapolis: Hackett, 1997. Doomen, Jasper, "The Problems of Scepticism" Logical Analysis and History of Philosophy 10 (2007): 36-52. Flintoff, Everard (1980). "Pyrrho and India". Phronesis. 25 (1): 88–108. JSTOR 4182084. Halkias, Georgios, "The Self-immolation of Kalanos and other Luminous Encounters among Greeks and Indian Buddhists in the Hellenistic world". Journal of the Oxford Centre for Buddhist Studies, Vol. VIII, 2015: 163-186. Hankinson, R.J., The Sceptics, London: Routledge, 1995. Jayatilleke, K.N. (1963). Early Buddhist Theory of Knowledge (PDF) (1st ed.). London: George Allen & Unwin Ltd. p. 524. Kuzminski, Adrian, Pyrrhonism; How the Ancient Greeks Reinvented Buddhism, Lanham, Lexington Books, 2008. Long, A.A., Hellenistic Philosophy: Stoics, Epicureans, Sceptics, University of California Press, 1986. Long, A.A. and Sedley, David, The Hellenistic Philosophers, Cambridge: Cambridge University Press, 1987. Striker, Gisela, "On the difference between the Pyrrhonists and the Academics" in G. Striker, Essays on Hellenistic Epistemology and Ethics, Cambridge: Cambridge University Press, 1996, 135-149. Striker, Gisela, "Sceptical strategies" in G. Striker, Essays on Hellenistic Epistemology and Ethics, Cambridge: Cambridge University Press, 1996, 92-115. Striker, Gisela, "The Ten Tropes of Aenesidemus" in G. Striker, Essays on Hellenistic Epistemology and Ethics, Cambridge: Cambridge University Press, 1996, 116-134. Svavarsson, Svavar Hrafn, "Pyrrho’s dogmatic nature", The Classical Quarterly, 52 (2002): 248-56. Svavarsson, Svavar Hrafn, "Pyrrho’s undecidable nature", Oxford Studies in Ancient Philosophy, 27 (2004): 249-295. Bett, Richard. "Pyrrho". In Zalta, Edward N. Stanford Encyclopedia of Philosophy. "Pyrrho". Internet Encyclopedia of Philosophy. Laërtius, Diogenes (1925). "Others: Pyrrho" . Lives of the Eminent Philosophers. 2:9. Translated by Hicks, Robert Drew (Two volume ed.). Loeb Classical Library.